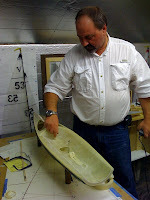 Today I took the tape holding the deck to the hull off and sanded the edges down to make a smooth hull/deck joint. I still have more sanding to do. I then cut the holes for the mast tube, main sheet post and the battery/receiver pot. Hew came by to supervise and took these photos. After cutting the deck to hold these items I then mixed up some epoxy thickened with adhesive filler and filled the gaps between the deck and the mast tube and main sheet post. 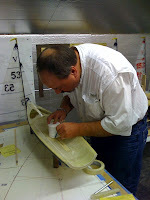 I also put some of this epoxy mix to secure the base of the mast tube and main sheet post to the hull. This will cure overnight. Next I will cut the protruding mast tube to deck level and sand smooth and trim off some of the main sheet post.